The Flash is probably one of the best television shows today. The writers bring you into the story and you feel invested as to what happens. The actors seem like a real team and their problems and achievements become yours. Probably the best family-oriented superhero television show on the air has captivated a new generation of DC Comic followers and has regenerated interest with the older generations. Grabbing our attention at lightning speed with great storylines, a lighthearted romance that can be appreciated by all ages, as well as family values, Warner Bros. and DC Comics has brought prime time alive again with The Flash, even when there are unforeseen consequences that we regret. Grant Gustin (Glee) is the Flash/Barry Allen. For the past three seasons, he has captivated audiences with his portrayal of Barry Allen a.k.a. The Flash. His boyish good looks and his seeming innocence penetrate even The Flash. Always wanting to help and do the right thing sometimes backfires for Barry, as we see Season Three start. The Flash runs backward through time to save his mother and father and have a life with them- that really doesn't exist- except in what will be known as Flashpoint. What Barry doesn't realize is that not only will he change the future for him- he will forever change the future of his friends when he finally realizes that he must step out of Flashpoint and re-enter reality. Changing the future creates many new memories. Wally (Keiynan Lonsdale; Insurgent) becomes Kid Flash and is always off to prove that he can handle exactly what The Flash can handle- and better- except when he can't- and then when he can. Candice Patton (The Game) plays Iris- Barry's love interest and instead of remembering the love they shared and their first (and second kiss), Barry has to woo Iris all over again. Carlos Valdes plays Cisco Ramirez, who, before Flashpoint was Barry Allen's best friend, but losing his older brother and finding out during the season that it was due to Flashpoint, puts a serious wedge in their friendship. And, of course, Tom Cavanagh (Yogi Bear) who plays several characters- Eobard Thwane, Reverse Flash, Harry, and of course, this season's favorite rendition- H.R. is absolutely fantastic as we see the development of his character from musician-idea man into a savior of the team, who makes the ultimate sacrifice, putting others before his own happiness. Besides changing the future for his friends, Barry Allen also brings a new coworker to the front- Julian Doran, another forensics genius that appears to be Barry's superior. Julian is played by the talented Tom Felton (Harry Potter franchise) and brings a new dynamic to The Flash, as well as the team since all he wants to do is bring the Metas down. At first, Barry and Julian clash at every twist and turn and we find out that Julian is almost a bad guy- but a forgivable one. He falls in love with Caitlyn/Killer Frost (Danielle Panabaker; Time Lapse) and when he realizes that she is a Meta, he sees things in a different light. While Julian is obsessed with "curing" Killer Frost to get his Caitlyn back, Caitlyn has been struggling with her Meta abilities throughout the season and her internal struggle does color the season quite a bit. Not only does the team have to fight the villains, they also now must fight their friend. New villains are introduced and I like that they each have a part to play in the cohesiveness of the season. Alchemy and Savitar are the focus of the season with some other minor villains thrown in to sweeten the pot. Trying to stop Savitar throughout the season, and find out who he really is, is the ultimate theme of the last half of the season- and when he is revealed it is a shocker- not only to the viewers but to Flash's team. Despite the adversities that Flash/Barry Allen faces throughout the season, it seems as if he will get his happy ending - until he doesn't. It's a thrilling ride and one that can be followed by the young and the young at heart without any confusion. Season Three answers many questions but also leaves us with many questions that hopefully will be answered soon into Season Four. I don't want to fail to mention the crossover events that Warner Bros. and DC Comics present. Stephen Amell (Arrow) brings his character into The Flash, as well as Supergirl (Melissa Benoist). While I have to say that the musical episode Duet was interesting and beautifully done, it just seemed out of place in the big scheme of things. The episode did provide a basis for love and a reason for Supergirl and Flash to fight for everything, and if that was the sole purpose, then it makes sense. Warner Bros. gives us season three of The Flash in 1080p High Definition widescreen 16x9 with an aspect ratio of 1.78:1. The blacks are inky and colors pop. I love the special effects of the speed force with the blues and almost whispers of silver peeking out. The colors of the costumes work with each other- Flash's deep burgundy/red works with the muted yellow of Kid Flash's costume. The white/silver of Killer Frost's outfit and hair really emulate the personality of the character. While sometimes the day scenes seem a bit artificial, the night scenes are deep in color and provide a good background for everything that happens at night. The audio is presented in DTS-HD 5.1 Dolby Digital. Sound effects are pleasing and not overpowering. Background noises do not interfere with the dialogue. Even when Barry whispers to Iris and H.R hums when thinking of an impossible idea, you can hear the verbiage without strain. The DTS-HD 5.1 Dolby Digital is a full, luscious sound for this television show, highlighting both the deep resonance of music and sound effects, as well as the crisper dialogue. The Complete Third Season Blu-ray is replete with bonus features that every fan will love and every newcomer will eat up. Bonus features are provided on each disc. Allied: The Invasion Complex (The Flash): Crossover event explained. Synchronicity in a Flash: Neely and the live orchestra work on Duet. The Flash is probably one of the best television shows today. The writers bring you into the story and you feel invested as to what happens. The actors seem like a real team and their problems and achievements become yours. The bonus and special features provided on the disc are wonderful and only add to the classic story of love, perseverance, and sacrifice throughout this season. 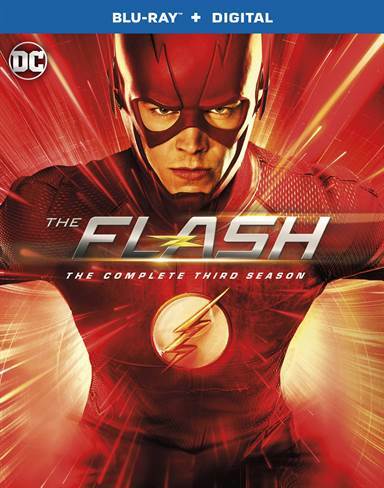 The Flash: The Complete Third Season is a must-have in your collection. Run to the store when it comes out because you never know- it could be gone in a flash. Download The Flash: The Complete Third Season from the iTunes Store in Digial HD.